Arsenal made headlines this morning when they defeated the 100%-at-home record Chelsea at Stamford Bridge. The score, a resounding 5-3 victory, is a testament to this year's downright inconsistency in the Barclay's Premier League. So now, in the same season, we have Manchester City 6 - Manchester United 1, Manchester United 8 - Arsenal 2, and today's 5-3 score. What has changed this season? Defense. In my view, the top clubs have focused increasingly on bolstering their attacking front and in so have forgotten about another key aspect of soccer. Box-to-box players are caught too far upfield to contain the opposing attackers. Two of Arsenal's goals came out of horrible blunders from the Chelsea defense. For Santos' goal, six or seven players were on the far side of the pitch, leaving Santos with plenty of space and just one defender to evade. 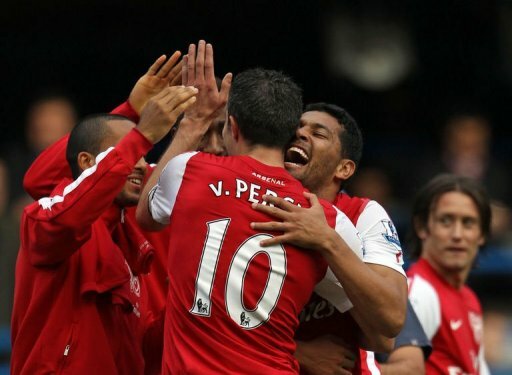 Van Persie's game-winner occurred due to an ill-timed back pass from Malouda to Terry. Petr Cech is also to blame for at least three of the goals today. You have to guard your near post. It's goalkeeping 101. Another aspect that came out of today's game is the reaffirmation of Robin Van Persie as a world-class striker. As Ian Darke put it, much is made of Ronaldo and Messi while players like the Ducthman go unnoticed until they score a hat trick. Arsene Wenger is finally getting this team to click. He still needs solidification in the defensive third but a place in the top four is within reach. For Villas-Boas it is also a time to look at his defense. Terry needs more help and he isn't getting enough from Ivanovic. Would David Luiz make a difference? And where does one pick up defenders these days? Italy? Spain? Germany? South America? Do the lines need to be pushed back downfield? Are wingers spending too much time up front? Whatever happens, for the rest of us it's just fun. If you're not a fan of the big four then you are enjoying the games for what they are. High kicking, high scoring, and no ties.